September 15, 2017. We are very thankful to report that in August 4 new girls (ages 17-22) were rescued from the Nepal-China border by local volunteer groups and were brought to live in the safety of our She Has Hope rehabilitation home. This brings our current enrollment to 13 rescued girls who are now receiving counseling and medical aid and safe room & board. They are also becoming skillful in several craft-making, seamstress, and cooking and gardening techniques, and are receiving support in basic literacy through daily coursework offered by our loving, full-time teachers. 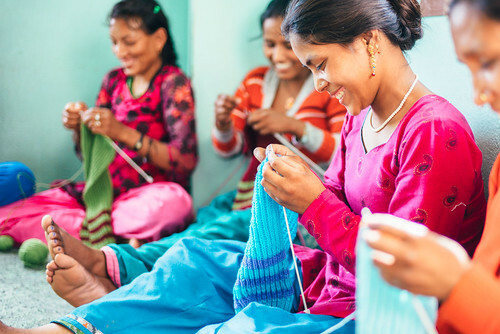 The girls are currently learning to make popular Nepalese dresses and how to knit sweaters, and they are growing beans and tomatoes in the rehabilitation home garden. All of these benefits and blessings will change the course of their lives forever, providing a future of hope, peace, confidence, and economic independence. The joy that Kavinya has already experienced with us is apparent, as her bright smile lights up the room. She gets along well with the other girls as they draw from each others' strengths in recovery. It is clear that they lift each other up while the other is down, sharing a common experience as survivors. Her new home is very colorful and clean, with several windows that allow sunlight to flood the spaces with light. It's a stark contrast to her previous living conditions, and she could not be any more happy to have found this new chance at life and freedom. She is clearly very grateful to be a part of our program, and we are beyond thrilled to have her with us.